The only thing harder than making a sale is making a sale online. People who shop online tend to be far pickier and do a lot more research regarding their options than real life buyers do. As such, if you want to see your profits climb, you’ll have to avail yourself of every possible advantage. While it’s harder to woo customers online, you can still make a killing if you’re willing to learn about the psychology of sales and pricing. Comparison tables are one of the simplest tricks you can use to subtly entice customers into choosing the products which will benefit both of you the most. Let’s take a look behind the curtain at what makes some prices and products more desirable than others, then check out the best pricing plugins available for WordPress. We know this isn’t a glamorous topic. In fact, you may have already asked yourself, “Tom, who cares about pricing tables?” during the time it took you to read this far down, but bear with us a little longer. There’s a reason why just about every online service advertises their prices using this format: the average customer finds it hard to judge prices according to their absolute value. But what does this mean? Take a hosting service, for example. These days a package targeted towards a run of the mill user with a personal website could cost you $10 per month at the very most, which of course, seems like a perfectly reasonable amount. That is of course until you find the outlier that will be happy to offer a similar service for just a couple of bucks a month, or see an expensive VPS which could cost you hundreds per month depending on your needs. It’s easy to be overwhelmed by all the different tiers of service if you’re not familiar with the minutiae that differentiate them. In this situation, a potential customer will weight the pros and cons of each package against his own personal needs and determine whether any given offer is a steal or a bargain by comparing it with the other tiers available. Therefore, he ends up using comparisons to gauge value instead of an analysis of the underlying costs of the service, or whether the provider’s markup seems reasonable (which would arguably be more reliable indicators of absolute value), because this data is not typically readily available. Companies understand this behavior and take advantage of it whenever possible, and thus we end up with pricing tables. They offer an elegant solution for any shop that sells separate tiers of a similar service because they highlight the key differences between packages, features, and prices in a manner that is simple to understand. A run of the mill pricing table will feature at the very least three tiers in order to establish a hierarchy of basic, regular, and premium services. The basic tier is meant to act as an entry level hook (with a free plan or trial available if possible), with only the bare minimum of features necessary to make it useful, but keeping the best stuff aside for the more expensive packages. If it’s well designed, a pricing table will make these differences easy to spot when comparing each column (and highlighted through visual cues) and the price points reasonable enough to convince customers to upgrade when the time is right. For your convenience, we’ve split our favorite pricing table plugins into two sections below: free(mium) and premium. You may find it interesting to note how the freemium plugins use the same comparison technique to push their premium versions. This handy little plugin is meant to be a one-stop shop for all your pricing table needs. It comes with several pre-made layouts (that range from minimalistic to whimsical), a simple interface, and an in-depth customizer in case you want to test out different configurations to check out what works best. Fully responsive and built to work with any theme. All pre-made layouts were built following the best practices in terms of maximizing conversion rates. Comes with an in-depth customizer. Tables can be re-arranged using drag-and-drop. Supsystic is a pretty well-known development team within the WordPress ecosystem due to their work on plugins for popular functions such as live chats, social share buttons, and photo galleries. This time, they’ve got another winner on their hands with their pricing table solution. Easy drag-and-drop table builder with visual tooltips to guide you through the process. Supports the inclusion of videos within your tables. You have one guess to figure out what this plugin is about. We’ll give you a clue – it’s got something to do with tables. Responsive Pricing Tables comes with an intuitive panel that makes table creation a breeze, but if you have any problems you can always check out its documentation or swing by the developer’s helpdesk. Simple table creation process with all the preset fields you might need in a regular price table (title, description, prices, time period, icons, and payment buttons). Enables you to highlight specific plans (one of the techniques we covered in our previous section). Insert your tables into any kind of post using shortcodes. If you want to customize every single last setting on your tables, look no further than WRC Pricing Tables. This plugin enables you to include an unlimited number of rows and columns in your tables. 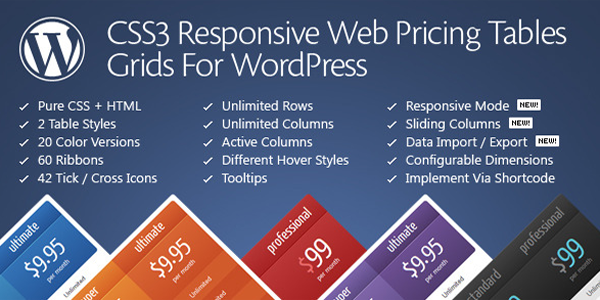 Handle your pricing tables using simple shortcodes. In-depth customization menus for every single option in your tables. Enables you to include tooltips for every feature listed in your packages. Includes simple animations such as enlarging columns upon hovering or disabling shadows when highlighted. Includes icons for ticks and crosses (commonly used when listing features). This is our favorite pricing table plugin and we’re far from alone in that assessment. According to Go Pricing’s own internal statistics, over 24,000 websites use it to power their own tables. By this point, you’ll have noticed that a lot of these plugins share similar functionality, but Go Pricing takes pricing tables to a whole new level (and believe us, getting users excited about tables is no mean feat). Packs a whopping 250 default templates for your tables. If there’s a visual style you’re fond of, you can rest assured you’ll find it represented within. Enables you to choose between over 1,900 fonts for use in your designs. Comes with a live preview mode. Integrated support for Paypal purchase buttons. Fully compatible with Visual Composer, which makes customization a breeze. All designs are optimized for touch devices. 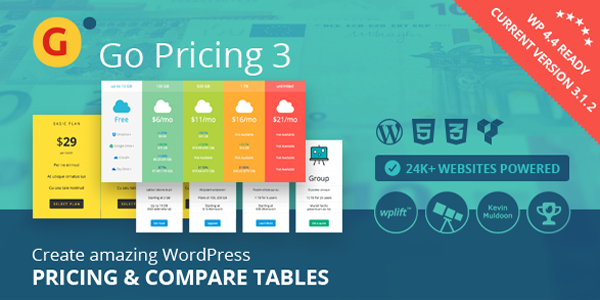 CSS3 Responsive WordPress Compare Pricing Tables is both a great plugin and a perfect example of what happens when you try to cram every single feature into a title. We’ve heard through the WordPress grapevine that the developers were this close to simply adding all of their full names to the title before cooler heads prevailed (this informational tidbit may or may not be a wild exaggeration). All kidding aside, this plugin comes with 20 different responsive tables in variations of two basic styles (all built with pure HTML and CSS) which are packed with features. Enables you to toggle between regular and sliding columns, expandable rows, and highlighted columns. Columns can be animated with hover states. Responsive mode can be toggled on or off. Over 40 icons to choose from for your list of features. All tables are implemented through shortcodes. 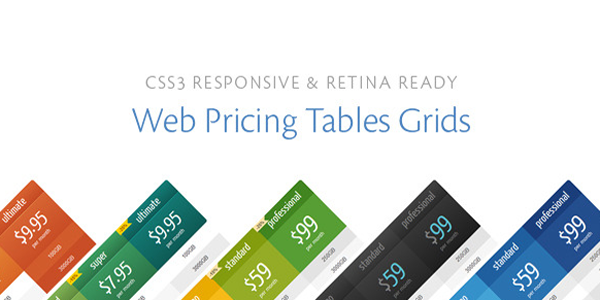 Clocking in at a very reasonable $6 per regular license, CSS3 Responsive Web Pricing Tables Grids offers a great solution for the budget-minded crowd. However, don’t let its low pricetag fool you; this is a feature packed plugin whose developers provide top-notch support to all their users. All default layouts are fully based on HTML and CSS, as well as being responsive and retina-ready. Enables you to highlight specific columns or animate them using hover states. While a nice pricing table can be a great hook for new customers, it’s not going to turn your business into a money machine overnight. To succeed, you need to study what your competition is doing, what their price points are, and what features they’re offering. If you can keep track of all this and beat them either in quality or prices, you’ll remain one step ahead. Pick the right plugin for your needs (and budget!). Use price comparisons to your advantage. Highlight the most attractive packages. Offer a free tier as a hook (if possible). Test different layouts in order to optimize your results. Do you have any particular insights when it comes making your prices more attractive? Share them with us in the comments section below! I really disagree with calling Easy Pricing Tables Lite by Fatcat Apps free (why call something free when the only reason it exists is to get you to update it to the “premium” version). It’s horribly crippled and they have 5 links to the premium version on the WP description page alone. Well the people behind the plugin have to make money somehow. Great Post, thanks for some really great plugin choices , Ive been looking at options and this has made things a lot simpler . I have had a question for a while, where do you get those fun animated/cartoon type pictures that you generally lead your wonderful blog posts with? Great article, thanks. Nowadays I’m enjoying DIVI “pricing table” module – if you are willing to “play” with the CSS you can make your own design. I’m sure those plugins have a fair amount of extra features (integration with PayPal is cool) – but even the “old” pricing table short code for Elegant Themes would do a nice job. Thanks for this post.Happy to see that your effort.You guys always try to help us.Just keep it up. TablePress is a great plugin if you want to build out a pricing table (Or any other table for that matter). Definitely worth a mention. I personally,I like Easy Pricing Tables Lite plugin works great on any wordpress themes out there.this plugin already responsive that’s why no need to make it mobile friendly that’s why i love this plugin most 🙂 anyways,Thanks for the great table plugin list.I will check out rest of the plugin asap! I wonder if the Author has actually ever tried using Go Pricing, or has he just cut & paste their blurb. I have never come across a more complicated or labor intensive plug-in in 8 years of WP design.